The Sun rises. The Moon rises. Stars rise. The Galaxy rises – twice. Each day the Earth rotates and sky objects (seem to) rise in the Eastern sky. The Sun, the Moon, the Stars, and the Galaxy rise at various times. The Sun “rises” once-a-day at the start of the day. The Moon “rises” once-a-day at different times of the day and night depending on the moon’s orbit around the Earth (its phase). The Stars “rise” once-a-day – all night long, one after another and in groups. The Milky Way Galaxy “rises” twice a day – once on its bright (center) side and then 12 hours later on its dim (outer arm) side. We can orient our bodies to the rising of the Milky Way. And we can experience our daily movement as “plunging through” this flat disk of stars. 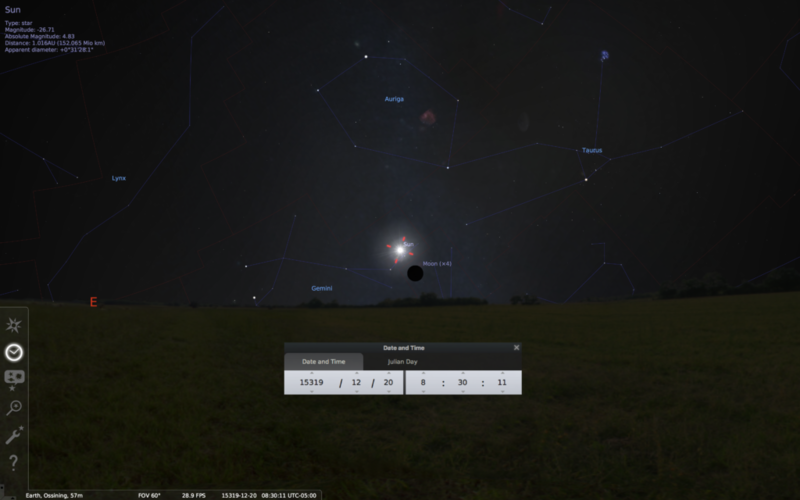 Right now the Sun and the Galaxy center rise at the same time around the Winter Solstice. Once a year they are perfectly lined up in the sky. However, this alignment is temporary! If you can wait about 13,000 years, the Sun will seem to move slowly across the sky. It will move from being aligned with the Winter Solstice point (the Earth’s Northern Hemisphere is tilted away from the Sun) to the Summer Solstice point (the Earth’s Northern Hemisphere is tilted toward the Sun). Eventually, the Sun and the Galaxy center will rise together at the Summer solstice. The reason this happens is because of a 26,000 year cycle called the precession of the Earth’s axis. The Sun and the Galaxy Center rise together in the year 15,000. The Milky Way is a giant physical structure. We are inside the Milky Way. It is quite dim so if you are lucky enough see it in the sky this exercise will be easy to follow. There are several bright stars and notable constellations that help us see the Milky Way even if we can’t see it. 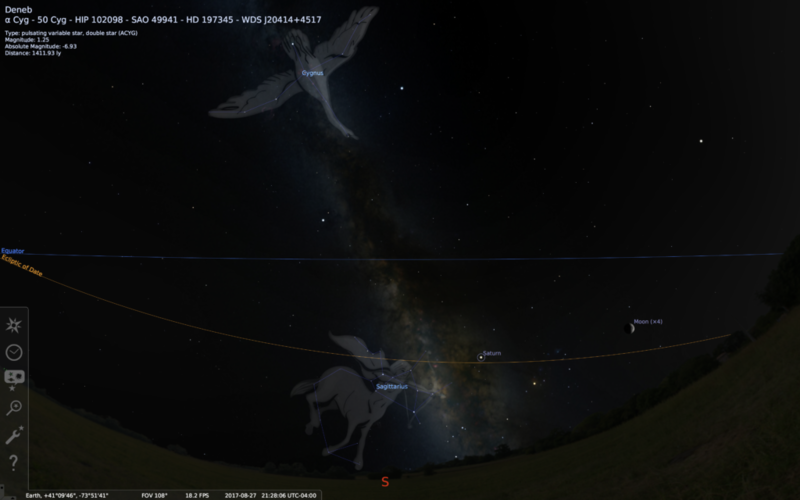 Cygnus (the swan – a summer constellation) will show you the Milky Way high overhead. Find Cygnus by finding the Summer Triangle asterism. Deneb (the tail of the Swan) is the brightest star in this constellation. To see the center of the galaxy find the constellation Sagittarius. 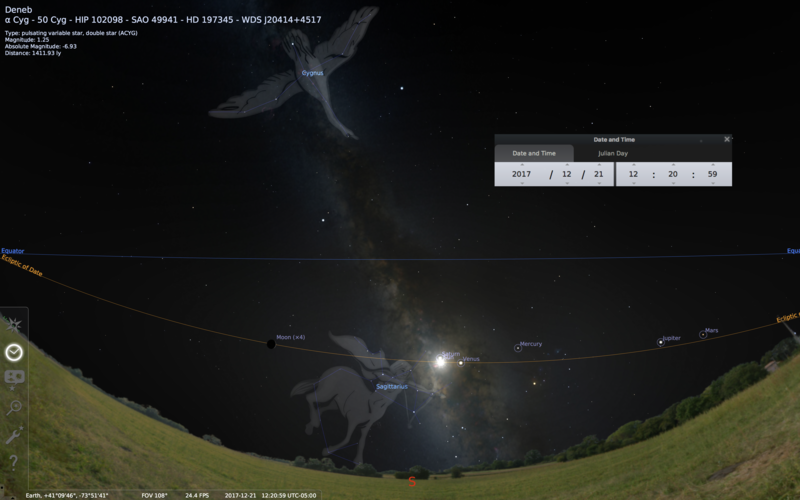 In the northern hemisphere, Sagittarius is visible through the summer months in the southern part of the sky. It has a famous asterism called the Teapot. This Earth Sky article can help you find it. It also contains the curiously named star: Nunki. 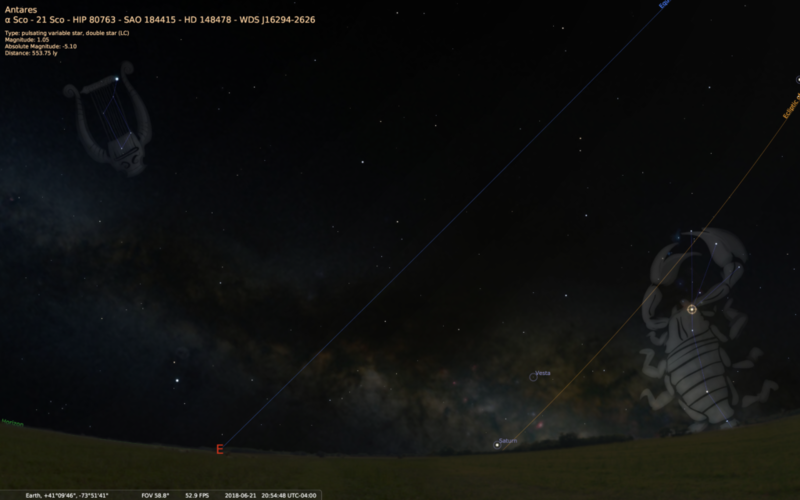 These will be our main guideposts for the Galaxy: Cygnus (Deneb) and Sagittarius (Nunki). Once a year the Sun and the center of the Galaxy line up. Right now in our time period in history this happens near the Winter Solstice in December. 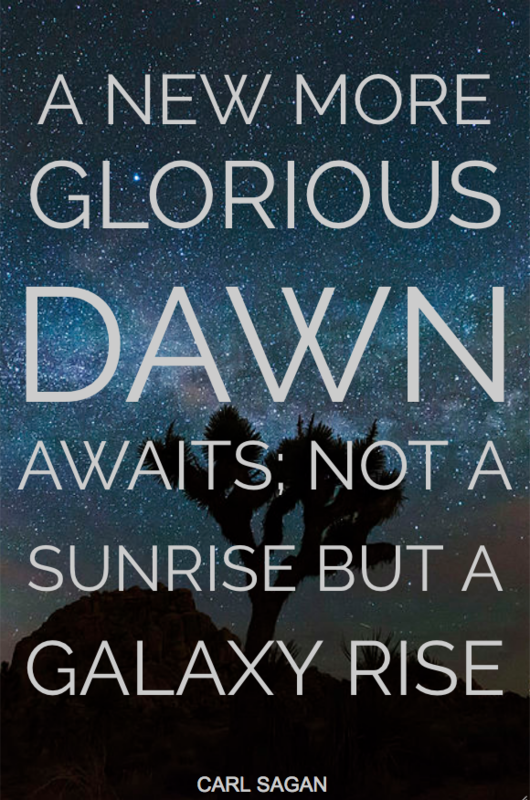 So, if you want to experience the Galaxy rise, you can experience it in December by watching the Sun rise. The light of the Sun blots out the dim light of the stars and galaxy, but, rest assured, it is there, behind the Sun – rising at the same time. At the Winter Solstice in the northern hemisphere the Sun and the Galaxy center appear to be lined up. Our Earth and Solar System are closely aligned – the tilt of the Earth (as measured from our equator) is only 23.5˚ off angle from the plane of the Solar System. However, the plane of the Galaxy intersects the plane of the solar system at a 60˚ angle. This means that the Galaxy does not easily “fit” into our normal view of sky objects. However, we can orient our bodies to bring them into alignment with the galaxy. This will help us feel and understand the position of the galaxy. To “correct” this angle and make it into a “horizon” you need to lie down. Put your head down on a nice soft pillow with the top of your head facing north and your feet pointing south. Roll onto your side and face east. You have now “corrected” your galactic angle. Imagine the rotation of the Earth toward the “rising” galactic center is carrying you “through” the galaxy plane. As you lie there – if you could stay sleeping like this for 12 hours – the galaxy center will rise past you, then the galaxy’s outer arms will rise. Antares (in the constellation Scorpio) and Vega (in Lyra) are two of the brightest stars in the summer sky. They both rise about 1 hour before the center of the galaxy rises. These stars always rise early in the summer evenings and hang in the sky through the night so you can easily find the galactic center – it is just below them (to the left of them if they are high in the sky). Scorpio and Lyra and their bright stars Antares and Vega with the galaxy rise behind them. The plane of the Milky Way galaxy is fun to find and easy orient to if you have the right guideposts: Cygnus (Deneb), Sagittarius (Nunki), Scorpio (Antares), and Lyra (Vega). We can watch the Milky Way galaxy center rise in the early summer skies. If we wait long enough, the outer arm of the Milky Way galaxy will rise as well. This double Galaxy Rise repeats every day.